The biggest mistake we see companies making when authoring their documentation is misunderstanding the relationship between scope and detail in their help articles. They are violating the Goldilocks principle. They either deliver too much information or not enough. If your readers feel like the guy in the video below then you know that you have a scope and detail problem in your documentation. When you add too much detail to an article you decrease the reader's ability to understand and apply the information you are trying to communicate. The ideal approach is to create many small articles, with varying amounts of scope and detail. 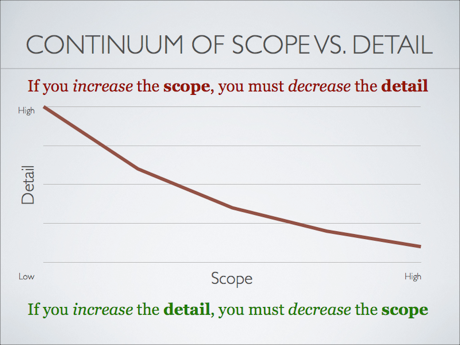 This next video explains the proper relationship between scope and detail. If you are going to write an article that is very broad in scope, limit the detail you include. If you are going to write a highly detailed article then limit the scope. If I were writing the help files for Google Analytics I would write many small articles. One of those articles might be titled, "Using Goals." In that article I would limit the amount of detail I would include. I would try to focus on a broad overview of goals and not include every detail you need to set up and use goals. Each article would be fairly short and would strike a good balance between scope and detail. For each article you write, focus on this balance of scope and detail. If you are going to write a high-detail article then limit its scope. If you are going to write an article with a broad scope then limit the detail.